Representative from Sweden, Finland and Norway met at the Photonics21 PPP Annual Meeting 2018. 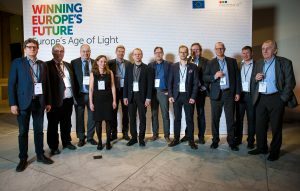 For the third time PhotonicSweden and Photonics Finland are collaborating in arranging a joint Nordic Workgroup Meeting before Photonic21 Annual Meeting. In the Nordic Workgroup meetings we discuss the importance to attend the Ph21 WG’s, since our Nordic countries are relatively small and could gain strengths by having a stronger voice if we can discuss what’s important for our Nordic countrie’s photonics companies, organizations and academies.